Could Gold become your new beauty routine eldorado? Gold always fascinated us and served many purposes throughout history. Some attributed magical properties to it and nowadays gold is considered as a revolutionary cosmetic ingredient. Cosmetic brands incorporating gold in their products are quick to mention Cleopatra’s beauty routine or the use of gold in rheumatoid arthritis treatment as an evidence of the amazing properties of gold. However the dermatologist community is divided on the real impact of gold in cosmetics and its potential toxicity. Gold in skin care products can be found flaked or liquefied (in moisturizers, eye creams lip balm, facial…), but fairly recently cosmetics brands have been using golden nanoparticles for their yet to be proven benefits. The golden nanoparticles activate the basal cells of the skin and boost their elasticity, the wrinkles are reduced, and every skin marks will disappear. You will look definitely younger. The golden ions stimulate the cells, veins and nerves improving your blood circulation and metabolism of your skin cells. The skin cells will secrete more waste and your skin will look healthier. Gold reduces the dryness of the skin preventing premature aging. Rumour has it Cleopatra was using gold mask as part of her beauty routine to keep her skin beautiful, glowing and youthful. Collagen is responsible for your skin elasticity, smoothness and flexibility. However as we grow old we produce less and less collagen. Gold can slow down the depletion of collagen in your skin cells. Gold reduces the production of melanin. The impact of sun exposition is reduced. Thanks to its antioxidant properties, gold helps to reduce acne or other skin allergies whilst improving blood circulation. Gold’s anti-bacterial and anti- inflammation properties helps oxygen to penetrate the skin and fosters cells renewal. It will leave your skin rejuvenated. Gold can breakdown elasticity and restore your skin elasticity. It is fair to assume that impacting skin healing could have the opposite effect than the one expected and could foster wrinkles formation and skin aging. More studies need to be done in order to fully assess the dangers and benefits of golden nanoparticles. One of the best ways to use gold to keep skin tight, firm and youthful, is as a facial mask, which puts a sheet of flat thin gold on your face to provide golden skin. 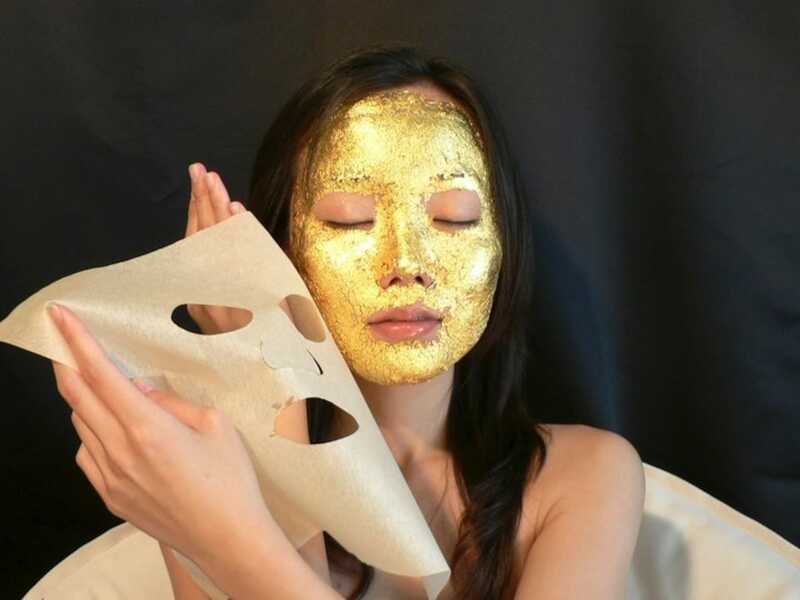 These gold facial masks are made with genuine 24-karat gold leaf, leaving your skin moisturized and elasticized. More importantly, while you wear one, you get to feel like a burnished deity! Created by nature perfected by human L’core cosmetics combines Nanotechnology with the best conductors such as diamonds and 24 k gold to bring your skin to perfection. L’core cosmetics are a breakthrough in the skincare industry that offers a natural selection and a non- surgical solution to face lifts, eye-lifts and skin rejuvenation. Eliminates the needs for going under the knife or injections, with all natural certified organic ingredients. Illumination is a unique glittering dry, oil with a mild fragrance. Upon application, a subtile veil of Gold adorns your body in a luxurious embrace of refined gold particles. An extravagant touch on the skin or shine to the hair. Digital marketing executive with 4 years of work experience within world leading fragrance houses. The digital has redefined the shopping experience for beauty products consumers. A recent study from Deloitte showcased that digital influenced 64% of all in-store sales in 2015.One step at the time new technologies are incorporated in the customer journey. From mobile applications to augmented reality, brands and retailers leverage these digital tools in order to offer a compelling experience to their consumers. Virtual Reality is becoming mainstream, the cost of the equipment is getting more and more affordable. Beauty brands and retailers already started using it in order to create an immersive experience for their consumers. Although these applications contribute to guide consumers through their shopping, a raising proportion of consumers would like to customize their makeup. Numerous brands have developed devices able to scan/copy colors and create customized makeup (Nail Revolution, Adorn 3D Printing Pen or Lancôme Le Teint Particulier) enabling consumers to match their makeup to their clothes. Both combined 3D printers and these matching devices are the future of makeup. They represent a significant growth opportunity for beauty brands. It is just a matter of time before they become the ultimate tool for consumers to create their unique style. Nail Revolution uses Colorcatch (colorimeter), this sensor scans the surface to copy and identify up to 5 major colour components. In order to do so the sensor analyses around 50 000 pixels separately. Once done, the customer can pick what level of each major components she wants for her nail polish. The nail polish is prepared in 3 min. Nail Revolution is able to create up 1600 colours. Nail Revolution should be released early 2017. One nail polish should cost around 20€. One step at the time DIY is becoming more and more trendy. It would be interesting to see whether this Nail Revolution could find its alter ego in other colour cosmetics products. Last estimation shows around 2 billion for smartphone users in the world and should reach 2.16 billion in 2016. Fragrances and cosmetics retailers needs to take this into account when building their strategy . They need to think mobile first in order to provide the best shopping experience to their hyper connected consumers. With an average of 50% of their consumers using their smartphone whilst shopping, point of sales need to be redesigned and integrate digital tools enabling retailers to assist their customers at every stage of their customer journey. Guide visitors : Using push notifications, visitors located within 50m from the store are invited to come in the store. Depending on how far they are from the store, an itinerary can be provided to them. Once inside the store, another itinerary will help them to find where their product of interest is. Identify zones of interest or evaluate the effect of a campaign: All smartphones connected to iBeacons can be tracked. Thanks to the iBeacons the retailers can identify what part of the store attract more people and for every smartphone a map of interest can be done. Welcoming visitors: Sending a personalized message or offer to a visitor as he/she is coming in the store. This can be used to address the needs of a loyal customer. Depending on the quality of the information we have on the customer, the message will enable to convert this visitors into a shopper. This type a message to customers gives a feeling of being treated like someone special and not any customers. Targeted discount: If we notice that a customer spends quite a long time in front of shelf, offering him/her an immediate/ limited discount could be the extra push the customer needed to purchase the product. Geo-localized discount: Informing any visitors in the vicinity about a discount. Marketing Campaign : Creating a game using the unlimited possibilities iBeacons can offer (Treasure Hunt).